My copy of the Autumn issue of Poetry London popped through the post today (Post, you say? Oh yeah – ) and lo and behold it contains a review – the first in print – of my book How To Build A City. I’m pretty ecstatic. 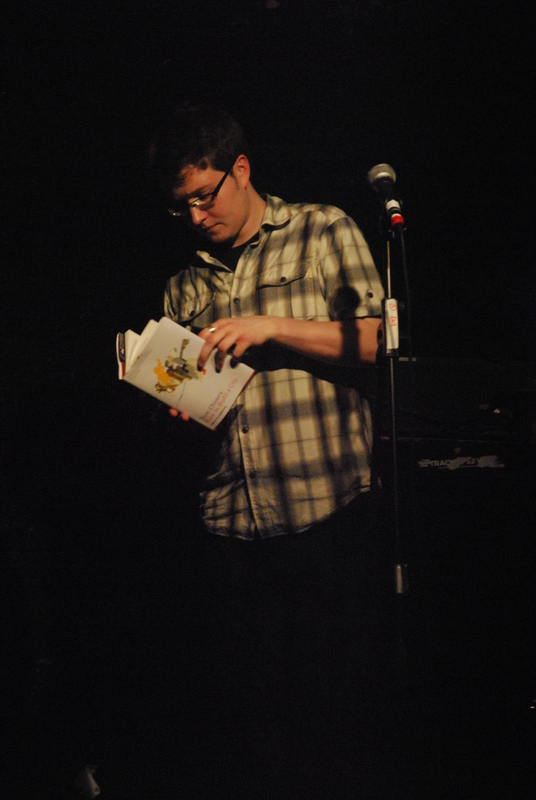 That horribly talented Luke Kennard was tasked with perusing my poems, and found them… to his taste. Worse luck, How To Build A City is so good it scares me. It’s a debut collection which is angry, vital and constantly surprising with a pleasing earthiness to the language. Chivers’s writing feels refreshing and necessary, a genuine, lyrical appraisal of contemporary life, something about the mediated layers of reality we experience every day. The lazy reviewer in me just wants to write something like from spam email to urban foxes, Chivers has his finger on the zeitgeist. Which is exactly the opposite of what the work’s trying to do, which it seems to me, is to stop us blithely using terms like zeitgeist at all. I really admire Luke’s work, so it’s great to get this kind of praise. I still have some signed copies of the book, so message me if you’d like one – and I’ll include a new original poem to boot. Alternatively, nab a copy from my publisher (which is also Luke’s… conspiracy theories start and end here). I’ve been out and about a fair bit this last week, handing out flyers for London Word Festival of course. A promoter’s job is never done. Firstly, The Poetry Society’s annual lecture at The Bishopsgate Institute on 31st January. 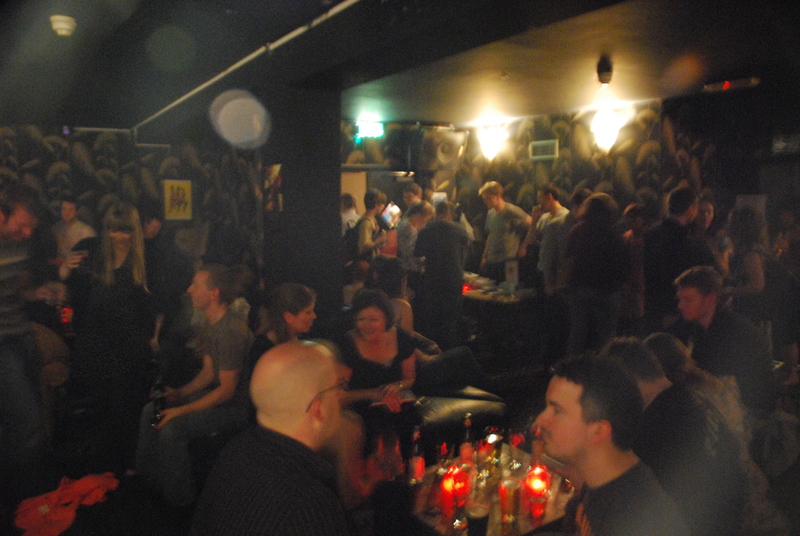 This is where I organised London Lip with Iain Sinclair et al. and I’ll be seeing quite a bit more of The Bishopsgate and its lovely staff over the Spring when I take up my official poetic residency there. The lecture was given by the US-based Irish poet and critic Eavan Boland (above). A striking speaker whose poise lent her words an air of urgency. But not as fierce as she looks in the photo! As she explained, the topic was ‘The Cartography of Poetry’ – ie. a state of the nation address – but she would limit herself to an evaluation of ‘the political poem’. An apt topic, I thought, and something more potentially controversial than, say, a reappraisal of the sonnet or the villanelle (as Boland herself pointed out). It’s also a topic that has been much in the mouths of writers and literary commentators. Since the millennium, we’ve had 9/11, Afghanistan, Iraq II and 7/7. And all that political instability alongside a growing sense of the threat of climate change. All of this brings the private, the domestic and the personal into the open, and forces writers and artists to question the value and purpose of their work. 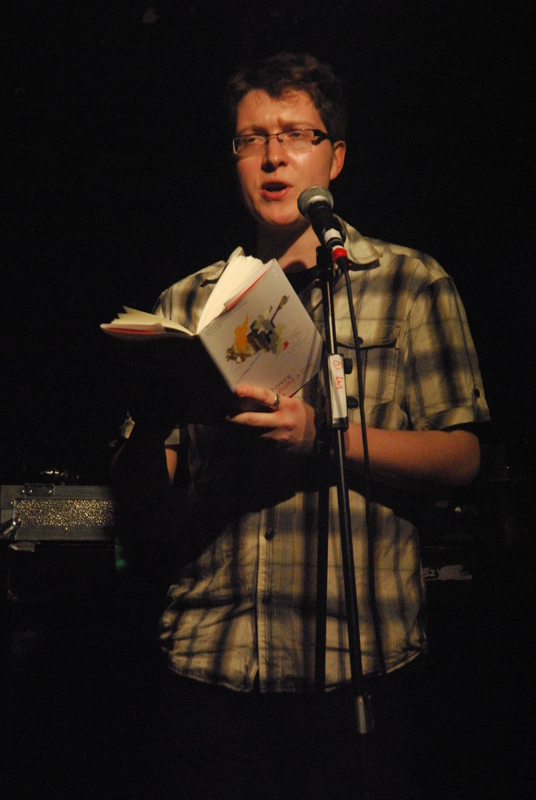 Boland began by citing the well-known literary bust-up between Denise Levertov and Robert Duncan, a dispute founded on their divergent views on ‘public poetry’. Specifically, Duncan resented Levertov’s involvement as a writer in the Vietnam protest movement and considered her political poems not only to lack, but to actively betray, the poetic imagination. Duncan’s own position is that ‘the poet’s role is not to oppose evil but to imagine it’. This example sets up a number of complex distinctions, both ethical and aesthetical, which I won’t even try to unpack here. Boland herself argued (and it’s a position I applaud) for ‘a disabling of the either/or’ approach to poetry. 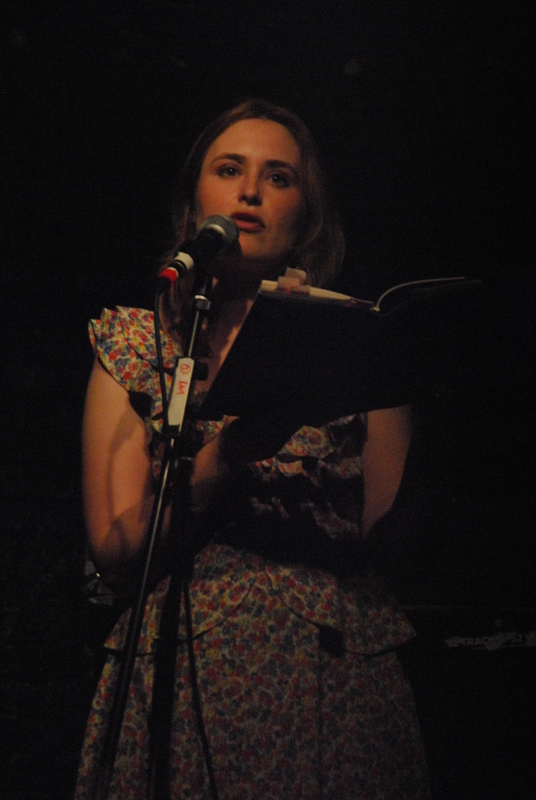 She also spoke of the need for ‘a rich, diverse and risky poetry’. This last adjective is most important and gives away her true position on the Duncan/Levertov argument – Boland calls for a political poetry that takes risks, that avoids easy conclusions. I’m with her on that. When ‘political poetry’ resembles the lazy doggerel Pinter and Harrison came up with in response to the Iraq war, it’s not worth reading – that kind of work is politically and artistically safe; it asks no questions; its constituency is self-assured to the point of being self-regarding. Preaching to the converted, in other words. Rather, Boland advocated ‘a disintegration of we’. I’m with her on that too. That’s partly why I like Chris McCabe’s work (see below…). Lastly, Boland touched on the politics of the environment, prophesising future conflict over nature poetry between, on the one hand, eco-poets who are socially, environmentally and politically engaged, and, on the other, those who espouse a largely Romantic, Wordsworthian approach (the latter being the more popular and well-established). Or to put it her way – a battle between a natural world which provides moral/spiritual instruction for the poet, and a natural world scarred and violated by human activity. This made me think of David Caddy’s work – rooted in the natural world and a small rural community, but international in character and politically and socially engaged. Readers might also be interested to note that political poetry, and specifically writers’ responses to climate change, is the subject of Making Nothing Happen, one of my London Word Festival events at The Bishospgate. 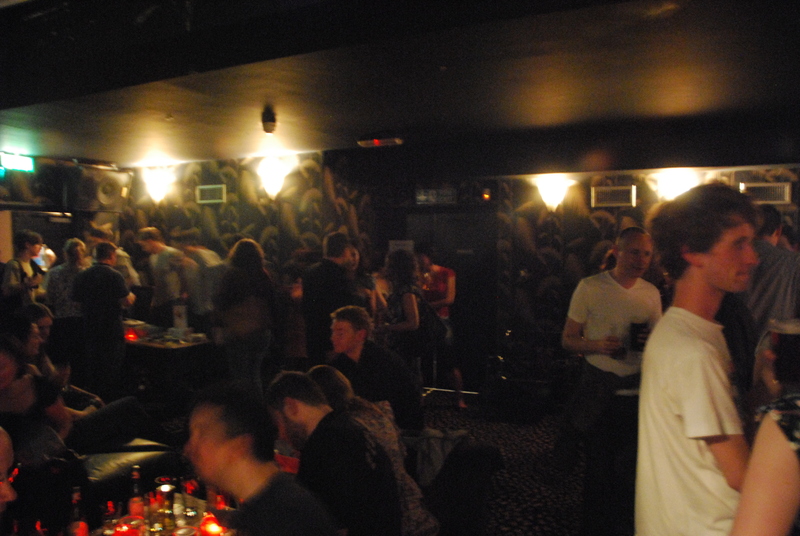 Friday 29th February with Mario Petrucci, Melanie Challenger, Caspar Henderson and Neil Astley. The rest of the evening was spent in The Water Poet, Folgate Street with Simon Barraclough and Isobel Dixon (whose responses to this post I await!). We wedged ourselves in the only space not entirely overrun with loud city workers – the pool room. Conversation ranged from poetry (obviously) to soap operas. Coronation Street was a favourite of mine and Simon’s, whilst Isobel introduced us to the South African soap Egoli (meaning ‘Place of Gold’). I also argued hard for The Bill, which I was missing at the time. 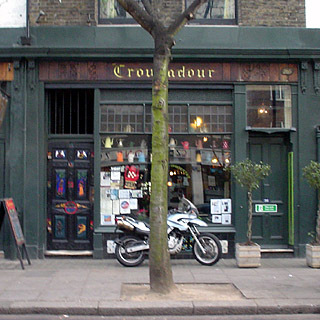 Then onto The Troubadour,West Brompton (above) on Monday night to witness the long-running Coffee House Poetry series coming head-to-head with Salt Publishing. A whopping ten Salt poets read (though I missed one or two, sneaking in during Tamar Yoseloff’s set) in the atmospheric basement venue. All the poets I saw were excellent and representative of the diversity of Salt’s growing stock of writers. Particular highlights for me were Isobel Dixon, Luke Kennard and Chris McCabe. Isobel’s work is gently pervasive. She reads with a confidence and firmness that belies the lyrical lilt of her poetry. Every consonant of her finely-tuned lines is articulated, which I like. 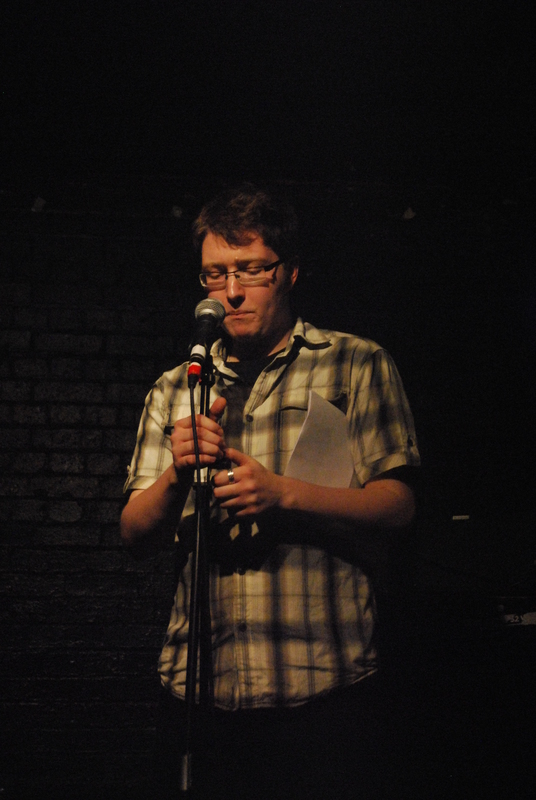 All too often poets rush through readings, aiming no doubt to capture the rhythms of speech, but ultimately mushing all the language into some comforting but unrecognisable pulp. I remember a particularly good line of Isobel’s about how her father’s beard hid a small face, or something like that. I paraphrase. Clive James is also a fan of Isobel’s book A Fold in the Map. It’s always a pleasure (I initially wrote ‘joy’ then crossed it out) to hear Luke Kennard read. 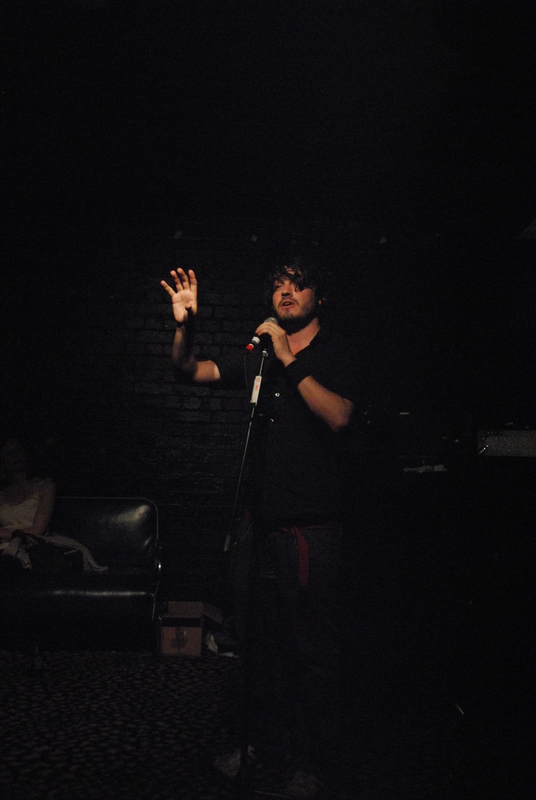 I’d heard a few of the poems he performed before – like ‘The Murderer’ for instance. His newer work was excellent too; in particular a piece about a couple meeting in an elephant’s graveyard. Luke’s a proper satirist, and also a very nice man with a fine selection of jackets. His poetry is popular even with people who don’t really like poetry, like the barmaid at The Troubadour, who asked him to post her a copy of The Harbour Beyond The Movie. This is always a good sign. The real highlight of the evening was Chris McCabe, who I’ve known since I published a poem of his in Keystone (Issue 5, 2004). Chris works in The Poetry Library on the South Bank and has recently become a father for the first time. His work combines linguistic experimentation and plenty of tonal disharmony with a genuine accessibility and, importantly, wit. 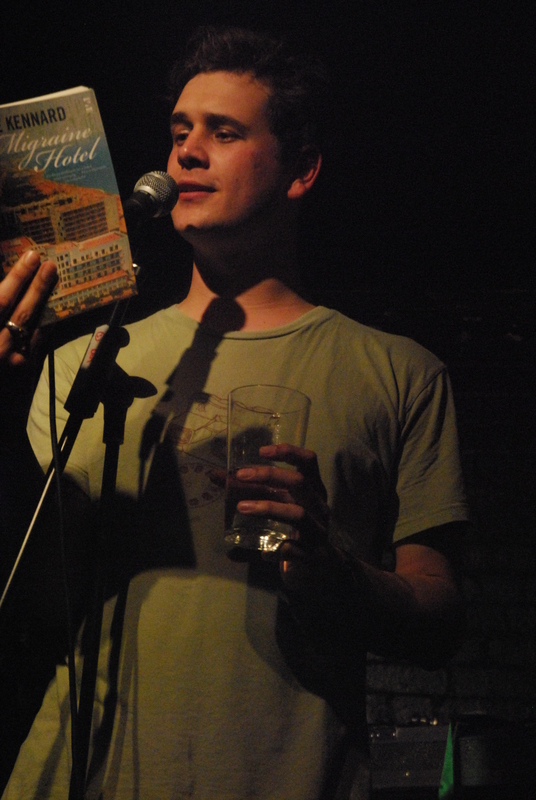 I’m never shy about giving my opinion, so here it is: Chris is the most exciting poet currently writing in London. There you go, I’ve said it… His first book The Hutton Inquiry is an impressive debut but too long and a bit patchy. His second book, also from Salt, is due out this year, and if I remember correctly from our conversation is entitled Zeppelin. I for one can’t wait. In fact I don’t have to, because David Caddy has accepted some of his work for the forthcoming Tears in the Fence. My recommendation? If you get the chance to see Chris read, take it up.